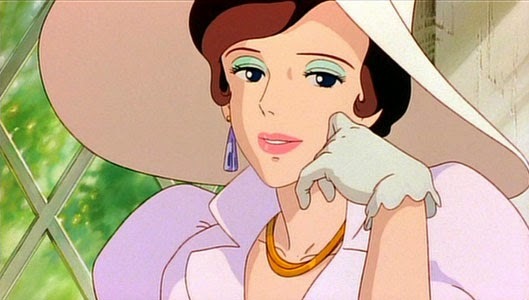 Porco Rosso (Japanese: 紅の豚 Hepburn: Kurenai no Buta?, lit. Crimson Pig) is a 1992 Japanese animated adventure film written and directed by Hayao Miyazaki. It is based on Hikōtei Jidai, a three-part watercolor manga by Miyazaki. The film stars the voices of Shūichirō Moriyama, Tokiko Kato, Akemi Okamura and Akio Ōtsuka. Toshio Suzuki produced the film for Studio Ghibli. Joe Hisaishi composed the music. The plot revolves around an Italian World War I ex-fighter ace, now living as a freelance bounty hunter chasing "air pirates" in the Adriatic Sea. However, an unusual curse has transformed him to an anthropomorphic pig. 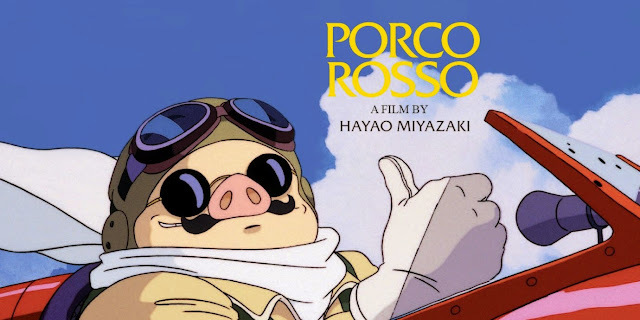 Once called Marco Pagot (Marco Rousolini in the American version), he is now known to the world as "Porco Rosso", Italian for "Red Pig". Porco Rosso, a veteran WWI fighter ace and freelance bounty hunter, responds to an alert over an attack on a ferry liner by airborne pirates. Having successfully defeated the airborne pirates, Porco retires to the Hotel Adriano, which is run by his long-time friend Gina. At the restaurant of the hotel, the heads of the pirate gangs are introduced to Curtis, an arrogant and ambitious American ace who has a contract to assist them. Within time Curtis falls in love with Gina but is frustrated to see that she has affection for Porco. After successfully executing a pirating mission, Curtis tracks down Porco, who is flying to Milan to have his plane improved, and shoots him down, claiming to have killed him. Porco actually survives, but all but the fuselage of his plane has been destroyed. Porco continues his mission to Milan, much to the irritation of Gina. Porco arrives discreetly in Milan to meet Piccolo, his mechanic. He learns that Piccolo's sons have emigrated to find work elsewhere, and much of the engineering is done by his granddaughter Fio. Porco is initially skeptical of Fio's abilities as a mechanic, but after seeing her dedication in the project to repair his plane he accepts her as a competent engineer. With no males to assist in the project, Piccolo calls up an all-female team to repair the plane. When Porco's plane is finished, he is unexpectedly joined by Fio on his flight home, with the justification that if the secret police arrest the team, they can say that Porco forced them to help and took Fio as a hostage. Stopping off to refuel on the way, Porco discovers that the new Fascist government is beginning to hire seaplane pirates for their own use, thus putting him out of business. 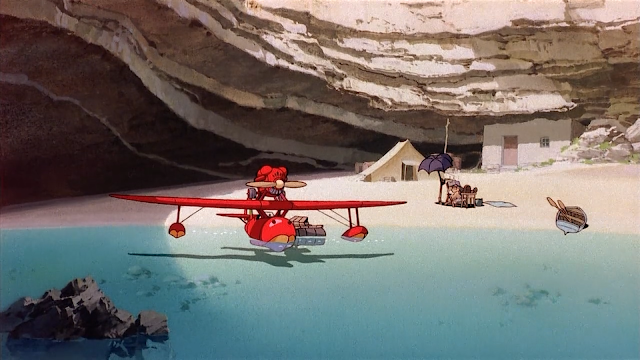 Upon returning home, Porco and Fio are ambushed by the pirates, who threaten to kill Porco and destroy his plane. Fio successfully talks them out of it, but Curtis appears and challenges Porco to a final duel. Fio makes a deal with him declaring that if Porco wins, Curtis must pay off his debts owed the Piccolo's company, and if Curtis wins, he may marry her. That night, at Fio's request Porco tells a story recalling an event in WWI, when he was still a human, where his entire squadron apart from himself was shot down in a dogfight with Austro-Hungarian aircraft. He recalls blacking out and awakening to find himself in complete stillness, with a white band hovering in the distant sky. Allied and enemy aircraft, flown by the airmen who died in the dogfight, fly past towards the band but ignore him. He sees his friend Berlini and calls him back but is ignored. Porco soon sees that the band is in fact thousands of planes flying together. He blacks out again and recovers skimming above the sea. When he awakes he discovers that he has been turned into a pig, and believes this to be a divine punishment for fleeing from the fight. The next day, the duel is arranged and a large crowd gathers on an island to observe. With the attendants betting heavily on the outcome, the contest begins. After an indecisive dogfight between Porco and Curtis, which soon dissolves into a bare fist boxing match, Gina appears to stop the fight and to warn the crowd that the Italian air force has been alerted and are on their way. Porco barely manages to win the fight upon her arrival, and hands Fio over to her, requesting Gina to look after her. Before the plane takes off, Fio gives Porco a kiss. With the crowd gone, Porco and Curtis agree to delay the air force together. When Curtis sees Porco's face he reacts with surprise. 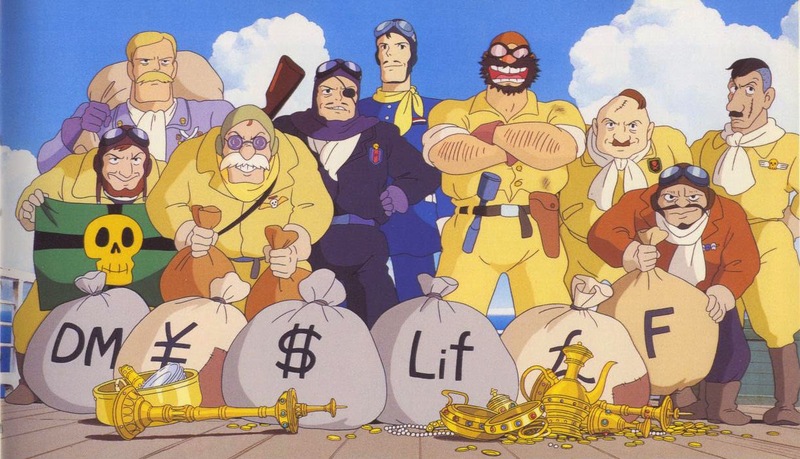 In the end, Fio becomes president of the Piccolo company, which is now an aircraft manufacturer, Curtis becomes a famous actor, the pirates continue to attend the Hotel Adriano.